Left-to-right, front: Mari Evans, Susan Taylor, Oprah Winfrey. On the back row: Maya Angelou, Joan Sandler, Angela Davis, Eleanor Traylor, Amina Baraka. Howard Dodson appears behind Sandler and Davis. 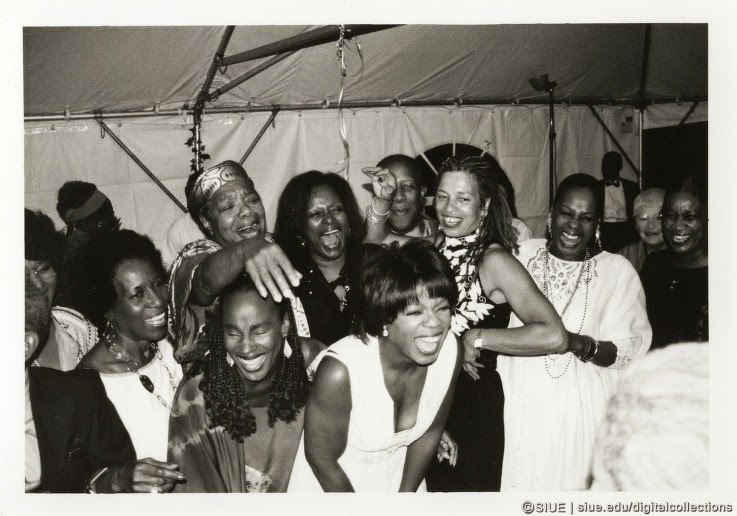 The women were laughing at Toni Morrison who was dancing one the occasion of her Nobel Party hosted by Angelou, 1994. Redmond photographed the event. courtesy Eugene B. Redmond and SIUE/EBR African American Cultural Life. In 2008, Oprah Winfrey’s people contacted Eugene B. Redmond and requested that he show some of his photographs featuring Maya Angelou for her upcoming 80th birthday party that Winfrey was hosting. Redmond and I immediately began brainstorming possibilities. Redmond has literally thousands of photographs of Angelou that he has taken over four decades, so we were looking at an amazing opportunity. We also faced an artistic puzzle. What images should we select and why? To make the exhibit of photographs for Angelou's birthday celebration manageable, I suggested to Redmond that we only include 80 of his photographs. He agreed. He eventually came up with the wonderful title for the exhibit, “80 Moods of Maya.” We had been talking about how many facial expressions that she takes on in the many photographs, so that title worked well. I can tell you that it was a challenge selecting just 80 photographs from Redmond’s thousands. I still don’t know how we did it. What was also amazing about the process was that as I flipped through the many, many photo albums and boxes of images, Redmond could take a look at any photograph and tell me, the year, location, and other people pictured with Angelou within a matter of seconds. “When and where was this?” I’d ask holding an image. “When was this one?” I’d ask passing him another image. “Oh, that’s in New York City in 2003,” he might say. Once we finally arrived at 80 images, I began the scanning process and prepared captions for the images based on Redmond’s notes and identifications. Redmond attended the 80th birthday celebration, and in addition to photographing the spectacular event that Winfrey put on, he also snapped images of the “80 Moods of Maya” exhibit. In 2009, Angelou made a visit SIUE to give a presentation. As a lead-up to her visit, the Dean of the university’s library agreed to let me put on a version of Redmond’s "80 Moods of Maya" exhibit. Right before her visit to campus, Redmond spoke with Angelou about the exhibit in our library, and she requested to visit. She also requested that Redmond and I give her a personal tour. Redmond and I of course obliged. I moved along quietly next to the two of them and marveled as they discussed the images in the exhibit. At many of the exhibit panels, Angelou would stop and gasp, and say “that’s me?!? When and where was that?” and look at Redmond for an answer. “Yes,” he'd say, and then tell her the location and year. “No?!? You photographed that?! ?” She’d respond turning to look at the image again. They repeated this routine again and again throughout the exhibit. It was amusing and joyous watching her looking at the images of herself and people she was photographed with and having Redmond confirm details about the contents of the photographs. Angelou was quiet and silent for some moments when she observed the images Redmond had taken of her and Coretta Scott King. She took moments as well with other images where she was pictured with friends who had passed. She became excited with happiness at other moments when we arrived at images of her dancing with friends, or of her enjoying moments with family, or of her pictured with young people. Later, I thought about the honor of being one among that trio: the shining subject (Angelou), the extraordinary chronicler (Redmond), and the curator (me). But in that moment, as I observed Angelou and Redmond interacting with the images, I only had one thought: I’m so glad to be a witness. What a wonderful honor to be a witness to.